#UPDATE #USCG ends search for missing person after searching 569 square nautical miles and over 41 hours with local agencies . #UPDATE #USCG continuing to search with a boatcrew and a USCG auxiliary aircrew, Tuesday morning. @uscoastguard #UPDATE Carnival Fantasy transferred the 23 individuals to Customs and Border Patrol in Mobile, Al., Monday morning. Working buoys isn&#39;t easy or glamorous. It&#39;s a dirty job that ensures safety and security on our nation&#39;s waterways. Here&#39;s to the hard-working men and women aboard Coast Guard Cutter Cypress. Heartland Unit Highlight: Marine Safety Unit Baton Rouge MSU Baton Rouge recently incurred a tragedy within our small Coast Guard family when the Executive Officer&#39;s daughter passed away. Addison Nell Robertson was only four-and-a-half months old when she died due to complications after heart surgery on March 19, 2019. She fought bravely in her short time here on Earth and to acknowledge that bravery and strength, and to show support to the XO&#39;s family, a couple of members, Petty Officer Hubert and Petty Officer Foran came up with the idea to do a Workout to Remember. They pitched the idea to the rest of the unit and everyone decided to complete the workout as a unit in teams. The workout was based on Addison&#39;s birthday, October 30, 2018, and went as follows: 40 minutes - As many rounds as possible: Run 100 yards 10 burpees 30 crunches 20 air squats 18 tire flips The run and tire flips were conducted as a team. Each person could pledge a certain amount per round they though their team would complete and any donations made would be distributed to a charity chose by the XO. The teams were made up of a variety of skill and strength level with the purpose to have friendly competition, but also to encourage everyone to push yourself through obstacles and difficulties, help out your team, and be tough in times of struggle. This workout showed how resilient and strong we can be as a team and Coast Guard family in support of the XO and his family during this incredibly difficult time in their life. MSU Baton Rouge did the workout on April 3, 2019, including the XO and his dad. There were 4-5 people on each team. In total the unit completed 45 rounds resulting in 103,500 yards ran, 10,350 burpees, 31,050 crunches, 20,700 air squats, and 810 tire flips. They raised over $1,100 to be donated to Up with Downs, a local charitable organization that works to promote acceptance and inclusion of people with Down Syndrome, raise funds for education, research and advocacy programs, and create a positive impact on the local community. Bravo Zulu to all personnel at MSU Baton Rouge for showing up and participating and proving exactly what it means to be a Coast Guard family and demonstrating the strength, character and support we all have for one another. Check out the hardworking crew of the Coast Guard cutter Cypress servicing and maintaining floating aids to navigation along the Gulf Coast. This week, Rear Adm. Paul F. Thomas and Master Chief Heath B. Jones visited the crews of Marine Safety Detachment Fort Smith, Arkansas, and the Coast Guard Cutters Muskingum, Mako, and Brant. Today is Ombudsman Appreciation Day! By volunteering on the homefront, ombudsmen help to ensure that Coast Guard members remain "Always Ready" by being available for families and helping them obtain necessary resources and information to be successful. That assurance provides our Coast Guard men and women confidence and helps them stay focused on the job. To all Coast Guard ombudsmen, your devotion and commitment is respected, appreciated, and an essential part of the Coast Guard. On behalf of the entire Coast Guard family, thank you and happy Ombudsman Appreciation Day! The graphic attached to this post is specifically sized to fit your Facebook banner. Feel free to download it and show your support! To learn more about the Ombudsman Program and ways you can support your ombudsman visit: www.dcms.uscg.mil/ombudsman. 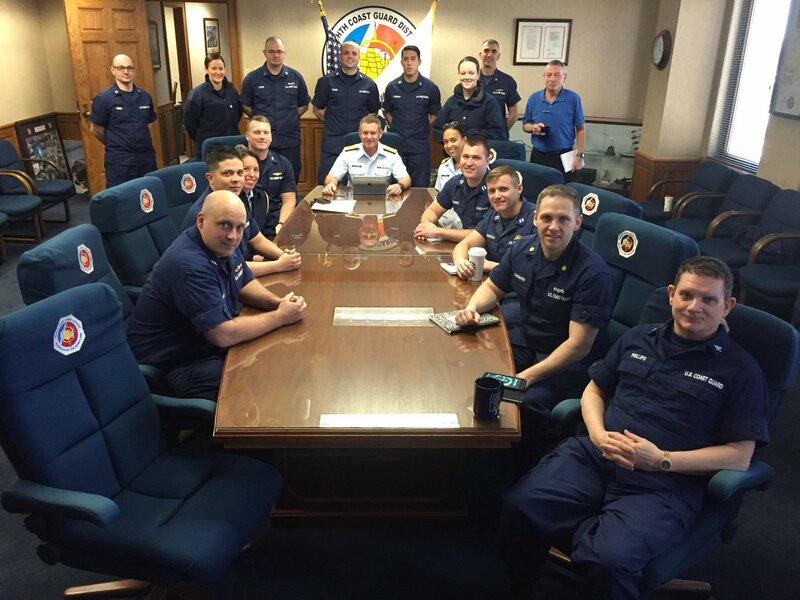 Coast Guard members from the Eighth Coast Guard District competed with members from the other military branches for the German Armed Forces Proficiency Badge at Naval Air Station Joint Reserve Base New Orleans. The German Armed Forces Badge for Military Proficiency is one of several hundred foreign awards approved for wear on U.S. military uniforms. To qualify, participants are tested in their physical prowess, marksmanship skills, first aid, and knowledge of nuclear, biological and chemical gear. An MH-65 Dolphin helicopter crew from U.S. Coast Guard Air Station New Orleans medevaced a person experiencing chest pain from a tug barge approximately 170 nautical miles south of Mobile, Alabama. Bravo Zulu! Members from Coast Guard Station Gulfport had a great time participating in Battle of the Forces. Battle of the Forces is a softball tournament between first responders and military personnel that benefits disabled veterans. Bravo Zulu! Last night, a Coast Guard MH-65 Dolphin helicopter crew from U.S. Coast Guard Air Station New Orleans medevaced a woman experiencing symptoms of a medical crisis from the cruise ship Carnival Glory. Bravo Zulu! #UPDATE @USCG Missouri River closure extended from mile marker 360 in Kansas City, Missouri, to mile marker 625 in Omaha, Nebraska. 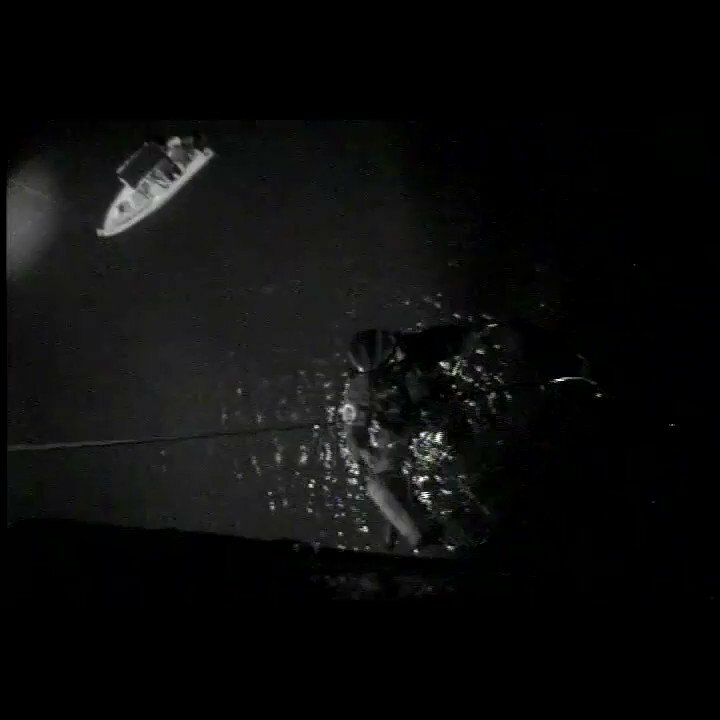 #UPDATE #USCG and Army Corps of Engineers discovered location of sunken vessel. General Anchorage remains closed. #UPDATE #USCG has reopened the waterway between mile markers 224.5 to 226. General Anchorage remains closed. #UPDATE Current queue due to waterway restriction is 13 downbound and 2 upbound. We need your help! The Coast Guard is attempting to identify the families of the crew of the Coast Guard Cutter Tampa who have yet to receive their ancestors&#39; Purple Hearts. Tampa was one of six Coast Guard cutters assigned to convoy duty in European waters during World War I. Her crew escorted 18 convoys, losing only two ships and earning a special commendation for exemplary service. On Sept. 26, 1918, during her 19th convoy, Tampa was torpedoed by a German submarine. Exploding amidships, she sank in just under three minutes. 130 men lost their lives, including 111 Coast Guardsmen. The sinking of the cutter was the single largest loss of life for the Coast Guard during WWI. At the time of Tampa’s loss, the Purple Heart was not authorized. Today, over 100 years after the crew of the Tampa was lost and 20 years after the first Purple Heart was awarded to one of her crew, the Coast Guard is still attempting to identify ancestors of her brave crew. Please visit https://www.history.uscg.mil/tampa/ for a complete list of the crew of the Tampa, their hometowns and directions on how to apply. Lt. Shafer fulfilled her dream of becoming a surfman in the U.S. Coast Guard and now serves as the commanding officer of Station Cape Disappointment. On #IWD2019, her inspiring story is not only a reminder of how far we’ve come, but how far we have to go.